The full detail of what assay marks mean, when they are needed and what they look like can be found on the London Assay Office website. Also the dealer’s notice, which is a useful overview. 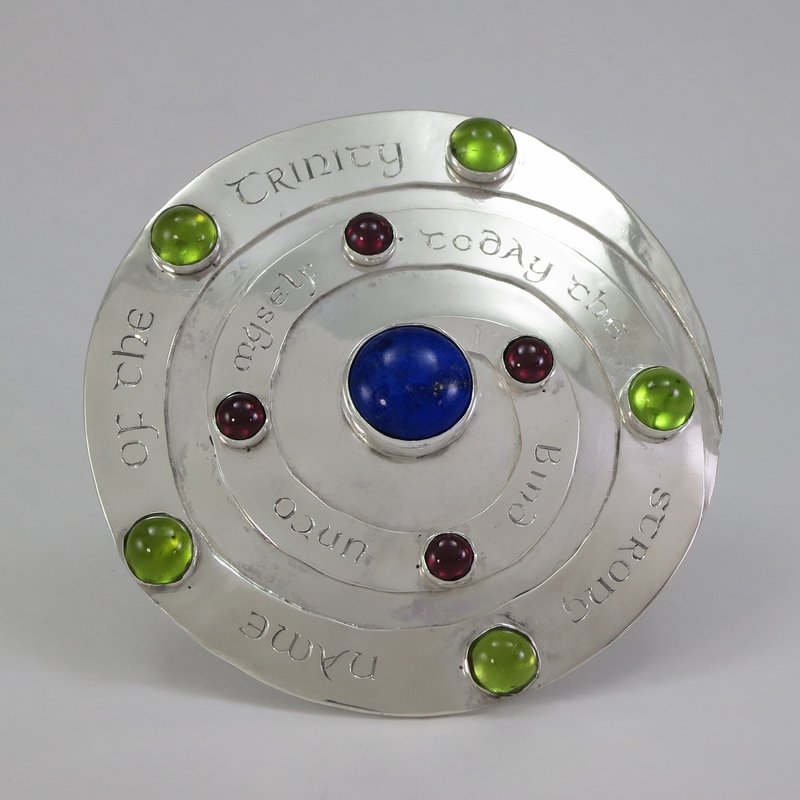 My work is always marked with the traditional assay marks and when possible any special marks, though in my time as a silversmith, there have only been two special marks – the millennium mark in 1999 and 2000 and the Queen’s Diamond Jubilee commemoration mark in 2011 and 2012. The date mark – 2000 – ‘a’ was the start of a new cycle. My sponsor’s name which is my initials in a distinctive shield. No one else registered at the London Assay Office has had or will have those in initials in that shield shape ever. 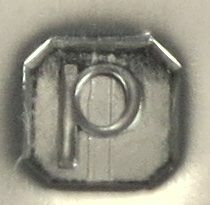 On the lid is repeated the traditional sterling mark. The full set is not applied to show the lid is a part of a bigger piece. The date letter allows you to determine the date the piece was assayed. There is a 25 year cycle of letters. Generally ‘J’ is omitted from the cycle of letters. For 1983, the letter is considered to be an ornate ‘I’. For the cycle starting in 2000, it was decided that ‘i’ and ‘j’ were too similar as were ‘i’ and ‘l’, hence ‘j’ was used for 2008. Books such as ‘Bradbury’s Book of Hallmarks’, give full lists of date letters for all the UK Assay Offices. My first marked work was in 1979 – ‘e’. The images below are date letters from a series of ingots – I have made at least one every year since I registered my mark. I’ve been doing it for a while now – that’s why I’m on a second cycle of letters! 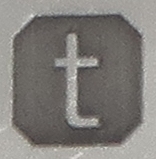 For ‘T/t’ the third image is the laser version of the mark rather than the punch/ struck version. 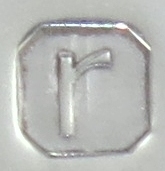 In 2011 and 2012, an extra mark could have been applied to commemorate the Queen’s Diamond Jubilee. I have had some pieces so marked. 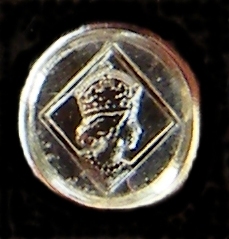 The Jubilee mark is show above and depicts a young Queen Elizabeth with an oversized crown in a diamond surround. My sponsor’s mark is registered at the London Assay Office (LAO) so I can only get work assayed there. It can be my work or that of anyone I care to sponsor (hence sponsor’s mark). The LAO have a list of charges for basic and supplementary services. Basically there is a fixed charge and a per item charge. The work has to be sent/ taken to the LAO and sent back/ collected. All silver sold must be assayed and hallmarked if it weighs above 7.78g. I like to have my work assayed even if it is less than that. To minimise the cost of assay across my clients, I aggregate my work to spread the fixed costs. So the timing of when the order is placed can be critical. The minimum turnaround time is three weeks, but it could be two months. I can always expedite my delivery by sending a special batch, but that would incur an additional charge of around £40 to cover the postage and the premium the Assay Office charge for rapid turnaround. Supplementary services by the LAO include display marks – very carefully applied marks for decorative effect and engraving. For each batch, I have to declare the level at which the batch is to be stamped, 925, 958 or 999. If I send a 925 batch and I include some 999 silver pieces, they will only be marked as 925. Assay Offices only check the silver is at or above standard. They don’t analyse for silver content and mark accordingly.